Imágenes Caribeñas. Albany Records 98. 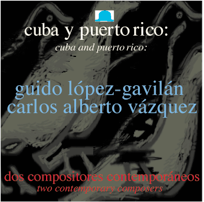 Cuba and Puerto Rico Two Contemporary Composers: Guido López Gavilán -Carlos Alberto Vázquez. 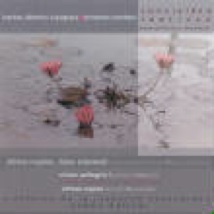 Double CD, one dedicated to Vazquez's music. CaribNet. 2001. Rapsodia Acquamarina. 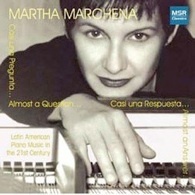 pianist Martha Marchena. Almost a Question... Almost an answer..
MS1219Parma Recording Fiesta Rugeliana with the Moravian Philharmonia Orchestra, Vit Micka, conductor. June 13 Olomouc, Czech Republic for a CD to released in the Fall. This is piano music from all over Latin America written in this new century... Every work here is in a post-modern vein with very few romantic flourishes. One gets a glimpse of regional dance motifs in Carlos Alberto Vazquez’s Rapsodia Acquamarina (1999), but these soon change into a lyricism that one might recognize as particularly Puerto Rican—or Caribbean. That holds true for every work here: they are modern but not particularly cranky or academically oblique... Some of it, indeed, is quite meditative, as in Book Before Breakfast by German Caceres (b 1954). 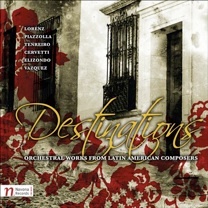 This would be a fine addition to anyone’s library of early 21st Century piano works from Latin America”.